Our Facials begin with a detailed consultation and in depth skin analysis using Matis Technology to identify your skins condition. A wonderful retreat that offers a perfect blend of cleansing, exfoliation, and moisturizing treatments for people on the go. A treatment to specifically address breakouts that are frequently associated with adolescent skin. 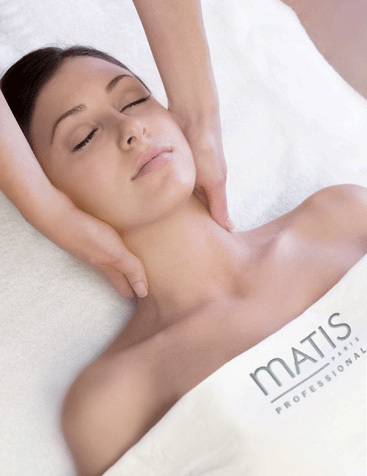 This facial includes cleansing, exfoliation with steam, and extractions using our MATIS Oil regulating ingredients. This relaxing facial will help control those unwanted breakouts and oily skin. A deep cleansing regimen, followed by an exfoliation treatment, pore extractions, warm towels and a moisturizing lotion. The primary focus of this treatment is to extract blackheads, as well as soothe the skin with a warm towel and customized moisturizer. A treatment targeted at the windows of your soul. A complete “facial” for the eye area including a revolutionary eye massage with glass spheres and a mask that test trials have shown decrease wrinkle depth by up to 27% and increase moisture by 60%. Designed for all thirsty skin looking to plump those fine lines and wrinkles. An exceptional source of hydration for those lacking comfort and suppleness making the skin radiant. This Nouveau signature facial is a custom blended facial designed for your skin’s needs. Service includes cleansing, steam, a toning face massage, exfoliation, and a nourishing masque selected for your skin type, leaving your skin refreshed, hydrated and looking radiant. This facial provides the ultimate regimen designed and prescribed for oily skin. It cleans without drying out the skin combining the best of nature with science. The skin is perfectly cleansed and refreshed, impurities and dead cells removed. Pores are tightened and the complexion is brighter. We offer the products for retail to support this ritual. Renew and transform your skin. Increases your skins smoothness and firmness while increasing your skins hydration. This amazing anti-aging facial provides an instant workout for the skin: lifting, toning, firming, smoothing, brightening and hydrating benefits – what are you waiting for! A targeted treatment using mixology with cocooning textures to speed up cellular regeneration, lock in moisture, improve skin texture and elasticity. For all women and men in search of a cosmetic response that treats expression lines with visible results. Corrective repair acts on 3 levels, relaxation of the muscles involved in the appearances of wrinkles, filling of wrinkle creases and restructuring of the skin The skin is visibly smoothed and wrinkles seem to disappear. With each application, the skin regains its firmness.